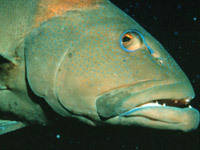 In recent years scientists have pieced together the dramatic life-cycle of reef fish like plectropomus, the coral trout. They have discovered it's a life lived against the odds. After World War II, fishermen used dynamite to catch reef fish. Today they use cyanide to catch them live. In addition to global warming, it's our appetites that are now threatening plectropomus and everything on the living reef. SPECIAL OFFER: THE PERILS OF PLECTROPOMUS was produced with a companion film called Silent Sentinels, which documents the unprecedented mass coral bleaching event that swept the world's tropical oceans in 1998, "International Year of the Oceans." You save $105 or 21% if you buy both films together. To do so, please order under Special Offers. "Startling graphics, beautiful images from many habitats, multiple interviews with top-notch scientists, and intelligent narration serve to inform and warn...The essential message...is that market forces are driving an intense fishery for reef species about which we know enough to recognize their vulnerability, but not enough to specify sustainable fishing levels, or predict the ecosystem effects of their decimation...The Perils of Plectropomus does a great job of recounting the natural history of the species... Throughout...it avoids errors of scientific convention, and effectively documents '...the pillage of coral reefs for short term gain.' We need more of this type and calibre of media for the communication of reef science to our students and employers." "There are a number of videos relating to coral reef life but...this video...combines a lesson about the biology of reef fishes with a discussion of the environmental effects of human actions. I found the video informative and well edited and I highly recommend it for high school, college, and adult viewers."